Wingz are a fashion brand, as you know, and we are for women of ALL shapes and sizes. We’re totally 100% body positive and we absolutely LOVE the fact that so many of our blog reviewers are plus-size positive role models who can rock an outfit (even more so with a pair of funky Wingz) and who are proud to wear the clothes that make them look and feel amazing. We also know that some of our customers adore Wingz because they aren’t 100% happy with showing their upper arms, and that’s totally OK with us, too. Sometimes it might just be plus size women who aren’t confident about their arms, or it could be that they want to cover up scarring, eczema or anything that makes them feel a bit self-conscious. It’s all great as far as we’re concerned. We were really proud to see so many of the bloggers we’ve worked with getting involved with the #WeAreTheThey campaign on Twitter last week – it’s about time ‘celebrities’ thought before they opened their mouth and insulted thousands and thousands of women. 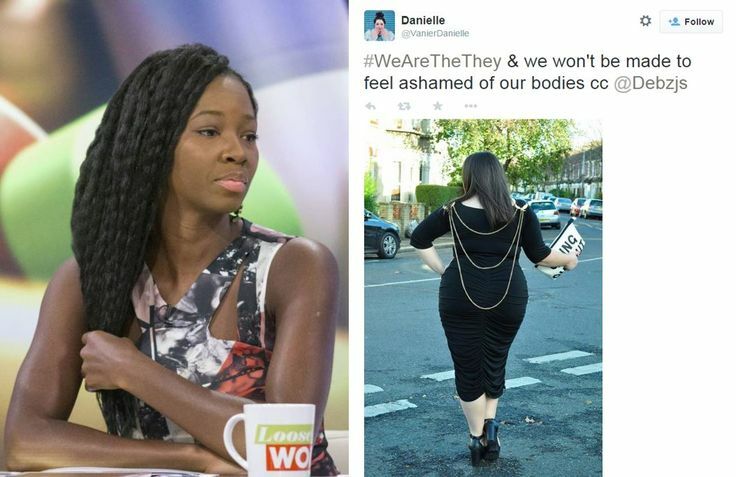 For anyone who doesn’t know, the ex-pop star Jamelia (famous for a terrible cover version of Sam Brown’s ‘Stop’ said on that bastion of positivity, Loose Women, that women of a certain size should be made to feel uncomfortable, and that they shouldn’t be catered for in the high street, because they were unhealthy. The next day, after a furious backlash, she backtracked, digging herself and even bigger hole, and said that only EXTREME sizes that were below a size six or above a size 20 should be forced into specialist shops. Oh, that’s OK then, Jamelia. The result was the #WeAreTheThey campaign, started by Debz from the Wannabee Princess blog. The ‘they’ part comes from the fact that Jamelia kept referring to anyone who didn’t fit into her standards of what’s acceptable as ‘they’. Nameless, faceless, they. It was amazing to see so many women pull together and support each other. Debz encouraged women to post images of themselves in fabulous outfits on Wednesday evening, and Twitter went NUTS. The best thing was that it wasn’t just women of size six and under, or size 20 and over who supported the idea. There were women (even men) of ‘acceptable’ sizes joining in to tweet their support. Maybe the tide is beginning to turn? Wingz is, and always will be, an inclusive fashion brand – we want to give all women the chance to change up their outfits with a set of sleeves that give it a new look. We love that they’ve been embraced so wholeheartedly by fabulous plus size women and ‘straight’ size women alike, and we’ll go on championing body confidence at the same time. We all deserve to look good, we all deserve to be able to find fashionable clothes, and we all deserve to be treated with respect.